Sometimes you have to be really creative living in a tiny house with a busy little boy. 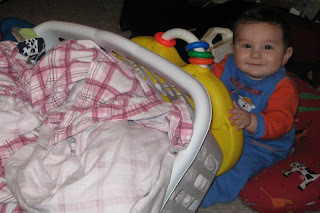 For example, if I want to get any laundry folded, this has been the way to do it. I strap this fun toy to the back of the hamper so we can face each other while we work. Here we have Daddy using his creativity. 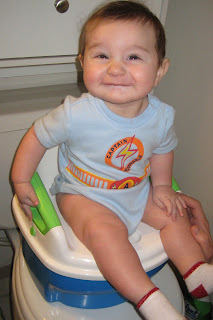 We had one constipated little boy (thank you solid foods ...), so Joshua thought putting him on the potty might help. No such luck, but he had fun acting grown up! Matt is a big fan of knocking over whatever block creation we make, so the other morning while I slept in (thank you Hubby!!!) 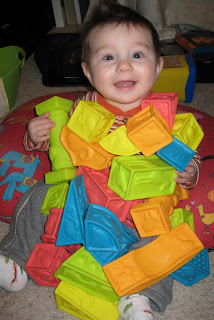 Joshua decided to build the blocks on top of his boy. Matty didn't mind at all and took the opportunity to chew on the top block without having to bend or reach! Have I mentioned we have a lazy little peanut? In other news, I have started taking a class to get my WA professional certification and have been suffering from migraines and sinus congestion. That should explain the lack of posts. Sorry Mom! I will try to be more on top of things!